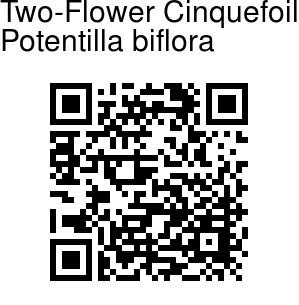 Two-Flower Cinquefoil is a perennial, bushy undershrub, growing in tufts. Flowers are generally 2, borne on a forked peduncle, flower-stalks 1-1.5 cm long, densely velvet-hairty. Sepals are sparsely velvet-hairy, generally nearly equal, inner sometimes longer, pointed. Outer sepals are oblong, inner ovate. Petals are 7-8 mm long, yellow, inverted-heart-shaped. Stamens are about 20. Sepal cup is hemispherical, densely silky. Carpels are few, style subterminal, about 3 mm long, flattened below, stigma not dilated. Rootstock is very thick and divided, densely covered with remains of deep brown leaf bases. Basal stem is short, subterranean, covered with brown sheathing stipules and dead leaf bases. Leaves and flowering stem are borne on the top of the basal stem. Flowering stem short, 2-3 cm, sparsely hairy. Leaves are ternate, mostly adpressed together at the base, a few ascending. Leaflets are 0.7-1.2 x 0.1-1.5 mm., terminal, deeply 3-segmented to the midrib, lower pair 2-fid nearly to the midrib or rarely undivided, segments linear, acute, revolute, coriaceous, pilose above and below. 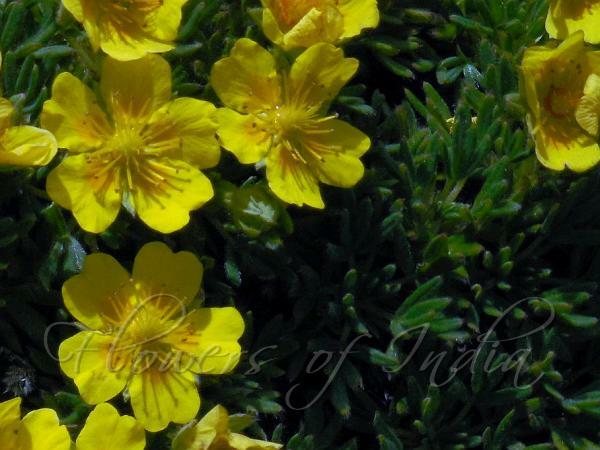 Two-Flower Cinquefoil is found in alpine meadows, gravels, rock crevices near snow line, in N Mongolia, Nepal, Russia, C Asia, North America, and the Himalayas, at altitudes of 2300-4800 m.
Identification credit: Krishan Lal Photographed in Zingzinbar, Lahaul, Himachal Pradesh.